Feedback: 62 comments - leave yours! 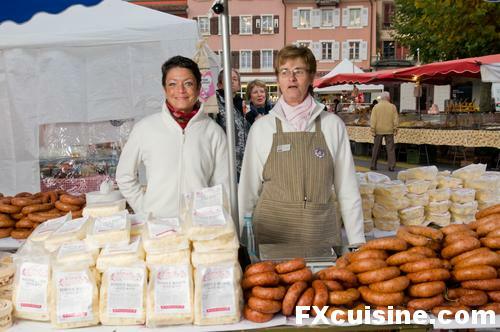 Every November 11th since 1496, the picturesque Swiss town of Vevey holds a country fair called La Foire de Saint Martin. I only had about an hour yesterday to shoot some pictures before rain worthy of the best days in Cork set in. Follow me in. This husband and wife team sells walnuts and chestnuts, which they roast in a converted barrel filled with burning charcoal. As I left after taking my picture, the man ran after me. This is our 22nd year selling chestnuts at the Saint Martin Fair, his said with some emotion. Tell that to your readers. Many people are not professional market operators but just mamas up the hill with a passion for an artisan product. Big packs of fondue mix - freshly grated cheese with a little cornstarch and instructions printed on the label and a pile of saucisse aux choux, a sausage made with fatty pork cuts and cabbage. It is smoked and needs to be cooked like a Jesus. ... and professional grocers like this gentleman from Algeria who sell fruits and vegetables from the whole world. We get all sorts of fresh mushrooms on this market, including lots of wild mushrooms from France. Unfortunately even if you show up at 7 AM, you never really get the very best quality, those get sold to restaurants. These guys sell various artisan spreads. The guy in the back was hiding while I took my first pictures. When I asked his friend if he was camera shy, he popped out and screamed You bet I am! We all laughed. These two mamas had spent the day before baking lots of pies and cookies. Left to right: cream pie, pumpkin pie, cooked wine pie which is made from a reduction of pear and apple juice, and their divine nonettes which I buy every year. 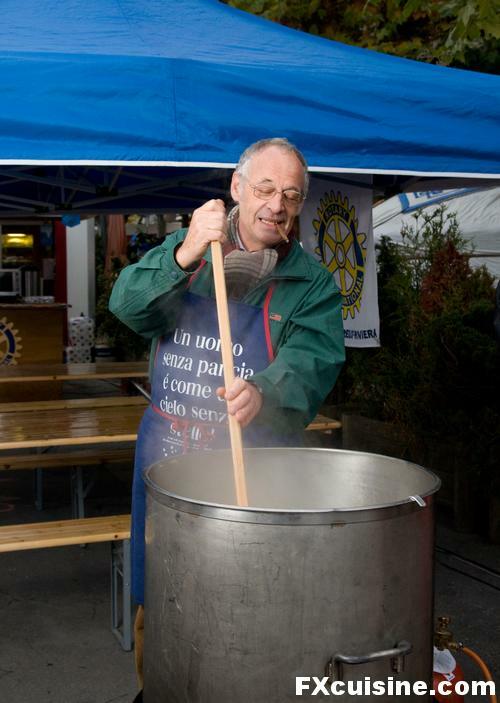 If there is one biscuit that is typical of Vevey's Saint Martin's fair, it is the nonnette. 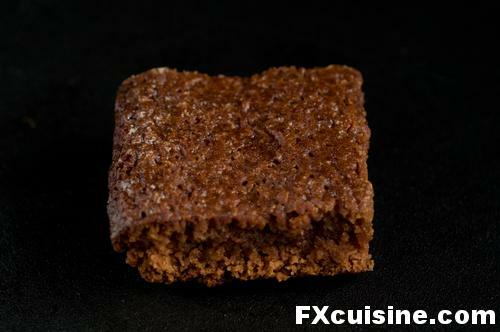 These are baked in a tray like brownies, but contain mostly honey, rhum and flour. Not much butter, if any, and very few spices unlike a gingerbread. If you like honey, you'll love them. If you don't, you won't. 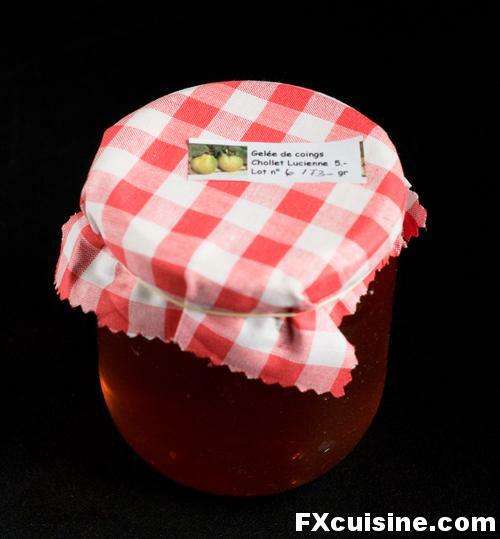 I am a fiend for quince jelly and bought them a jar, which released such a putrid smell that for a while I thought it was a poison gas canister left from the Great War. Such things happen with jams, and I'll get it replaced when I see them next. With those homemade jams, they also made two types of Linzertorte, apricots and raspberry (above). I got me one of those too. ... but when I saw huge bag of Magenbrot, she explained that they buy it from some semi-artisanal operation. ... but finally settled on this deliciously vintage aluminium strainer. My grandma had the same, said somebody in the crowd. I paid 10 Swiss francs. 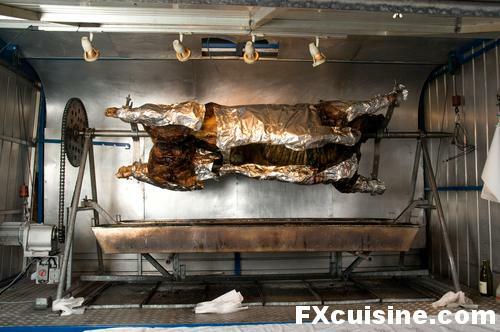 ... or have a slice of the whole ox that had been roasting for the whole night. If the rain bothers you, you can sit inside the picturesque former grain storage that overlooks the square. In La Grenette, you can sit down and enjoy a good meal with friends during the whole St Martin. Unfortunately as I came back after work, there was no beef left and even the roasted wild boar was gone. 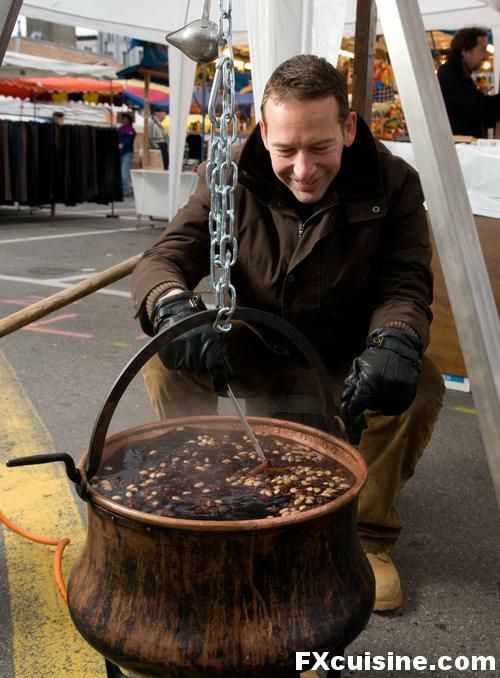 Many people sell vin chaud (Glühwein) at the Fair, this hot red wine mixed with spices and sugar. 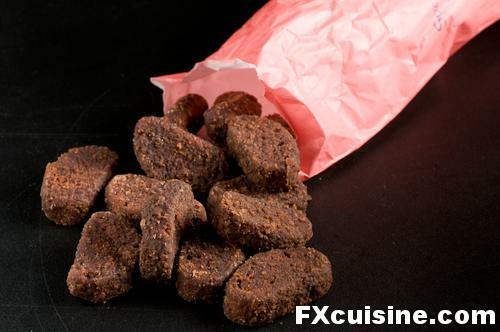 But some of them are made with bags of ground spices mix and make for a watery, tasteless brew. The best one is sold at the Battered Women League. 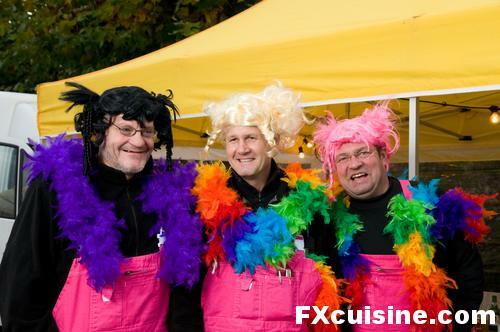 Or at least, that was the cause they sponsored last year, as in fact I discovered that these gentlemen meet up to support a variety of worthy causes, including one that is dear to my heart - proper vin chaud. The cauldron was filled with cinnamon sticks, star anis and loads of cardamom pods, with a good lacing of brandy to replace alcohol lost to evaporation. At 8 AM this was just what the doctor ordered. It is a bit on the sweet side, the guy warned me. Indeed it was. I suggested they might add a touch of lemon or orange to balance the excessive sweetness. They looked at each other, then one rushed off to the grocer and came back. We tried with the lemon - perfect. I also bought two loaves of my favorite bread, the sourdough I'll be using on Saturday to prepare bruschetta for my friends. ... a mixture of mustard seeds, molasses, spices and flour to thicken it. Spread it on a slice of cuchaule and close your eyes. Isn't life wonderful? FX's answer→ Well they'll certainly have this fair every year for the next 500 years - hope you get a chance to visit a future edition! What a great fair and wonderful market! The food looks awesome! FX's answer→ There is a smaller version every Tuesday and Saturday morning too! Definitely need to visit Switzerland at this time of year. Any chance of a recipe for nanettes or fudge? Can not get real fudge around where I live (Australia) any more, and I have tried in four states. It is all reconstituted gunk with artificial flavourings. FX's answer→ Lord Best, I'll try to post an article on both the nonnettes and the sort of fudge they make here, based on heavy cream and sugar. In the meanwhile, don't buy it at the store, mate, you'll die with that crap! You are brave! I had St Martin's noted on my calendar (I've gone in years past) but, not being Swiss, I don't have the fortitude for that kind of weather. I took my daughter to the 533rd Foire de Brent on Saturday and thought of FX Cuisine as we had our first ever malakoffs in one of the caves. 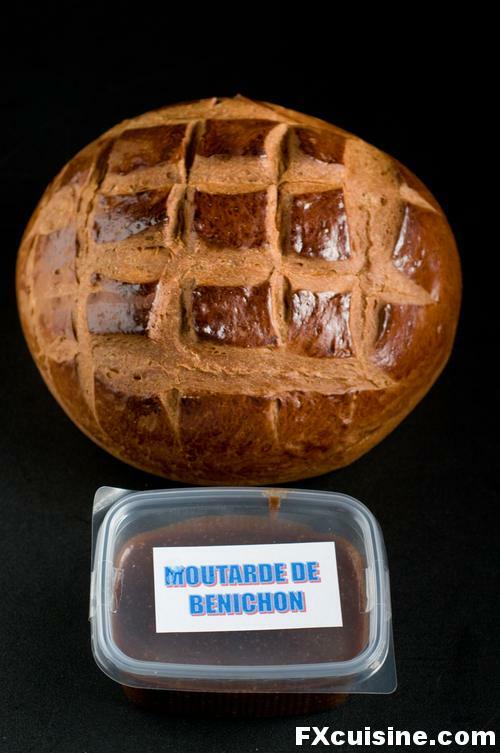 Our landlord had brought us a cuchaule from his excellent baker in Fribourg that morning so I picked up some moutarde de benichon to go with it. All my daughter wanted to eat on Sunday was cuchaule and peanut butter (that's what you get when you let Americans live in Switzerland!) There was a nonette lady there too--she fills hers with orange marmalade. What do you call the sourdough bread? Is that from one of the usual bakers at the marche? Also, are the guys who sell rilettes always at the marche? I got addicted to them during our trip to the Loire this summer. You didn't mention my favorite part--the little round cheese tarts that you can order hot and eat for lunch on the steps of the grenette. Those are great. Bon appetit and thanks for your reportage! 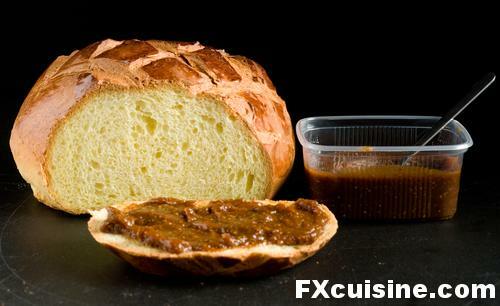 FX's answer→ Teresa I guess peanut butter on cuchaule is a sincere cross cultural dish! The sourdough is called "pain au levain", 3 of the regular bakers on the Vevey market offer it but the only really good one is that sold from the first lady when you come from the train station, between the trees and the Grenette next to the fish stand (when he decides to come!). 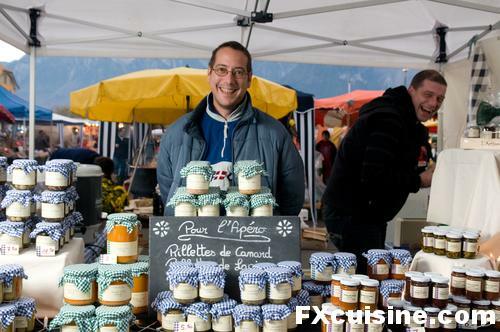 Yes the rillette guy is there on Saturday, but you'd better try and make your own I guess. The cheese tarts are called Ramequins and you can have them every Tuesday and Saturday from two of the bakers further along from the sourdough lady. FX's answer→ Angelica cuchaule is very good on its own but do try the "moutarde" if you can, it's sweet and spicy, not altogether different from Scandinavian mustard. FX's answer→ Thanks, unfortunately I couldn't stay the whole day to see the costume parade, horses, oxes and various politicians. Very colorful for sure! I so look forward to your emails. Your photography and comments take me away for a while. Thank you! FX's answer→ Thanks Lucy, glad my little articles bring a ray of sunshine into your morning! Thank you for the lovely tour of the fair in Vevey. Vevey was one of my favorite places in Switzerland and I cherish the memories. I certainly hope I can get back there one day. I enjoy your emails sooooooo much! Thank you again. FX's answer→ Thanks a lot Joanie, indeed the center of Vevey really is lovely, with this huge square opening onto Lake Geneva! Thank you for taking us to the fair. 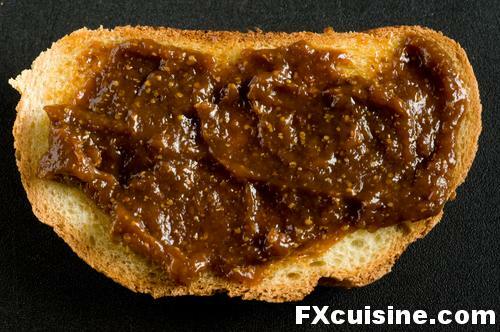 FX's answer→ Zorra, anytime for quince jelly! After a few years living in Switzerland, it's the first time I ever heard about the St Martin. 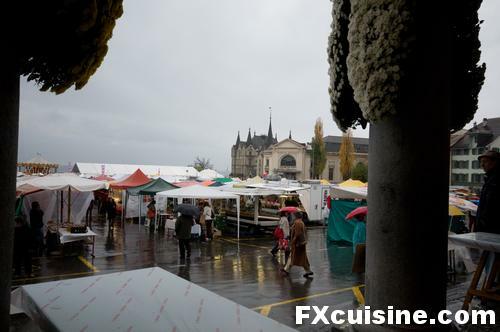 Without FXcuisine I would be missing many events, places and swiss dishes for another five years. Thanks again for sharing ! 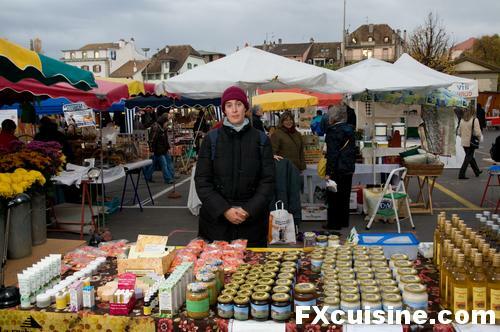 By the way I usually stick to the Marché de la Riponne in Lausanne every saturday. 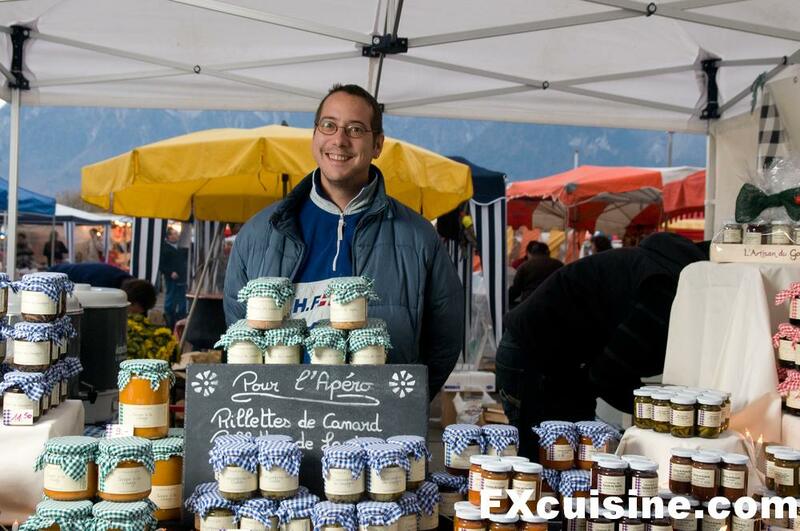 Do you know if Vevey's usual fair is worth the trip ? I heard it was one of the best place in the area to caught fresh fish from local fishermans. 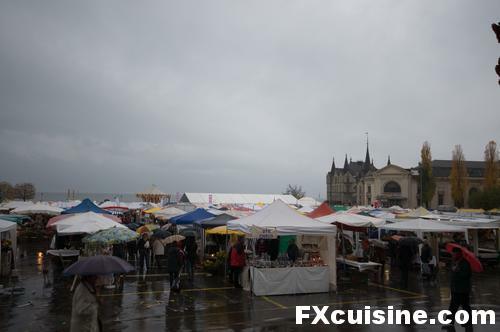 FX's answer→ Xavier I very much recommend you visit the market on Saturday, especially in July and August, it is really nothing like the market on Ceaucescu Square in Lausanne. They have alp horn bands and choirs and people drinking white wine and enjoying life in the Grenette, really quite magical. And even on these bleak rainy November days it beats Lausanne any day. No question! FX's answer→ Joanna I have recipes for both and will endeavor to make some nonettes so you can try them. Heavy stuff!
" Un uomo senza pancia e' come un cielo senza stelle "
FX's answer→ Maura, yes this guy was quite funny and I just missed a nice picture of his mates cheering him up while he cooked! FX's answer→ Candace, yes I used to wear blue shirts but the pink ones look cheerier I guess! Wonderful tour. Enjoyed the great photos and information about this excellent fair. FX's answer→ Gaetano, I hope you get to visit the fair in person one day! Such a fun tour! Thank you for bringing us inside Switzerland. FX's answer→ Glad you liked it Laura! 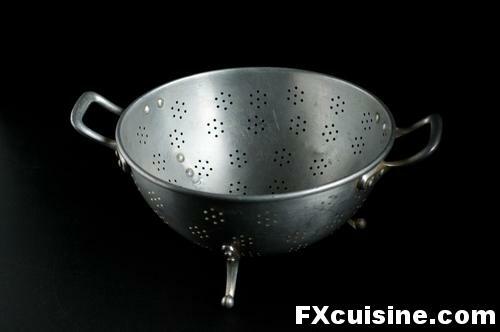 Ahhh...the vintage aluminum strainer. I rue the day I threw out my cheap, dented colander for the new, shiny stainless steel version. The old one strained away pasta water perfectly, while the new one just can't quite do the job. 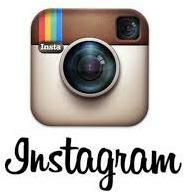 Your picture brought back fond memories and a resolution to always go with functionality over form every time! FX's answer→ Jensenly, I am sure you'll be able to buy back another of these old strainers from some garage sale, there must be millions of them out there. I don't use colanders as much as I do my Japanese strainer (not sure if that's the right word), a sort of giant spoon made of metal wire to fish out the pasta rather than throw the water through a colander. What a wonderful fair! Such a selection of delectable eats - I wouldn't know where to start. I'm about to relocate to Atlanta, Georgia and the culinary scene is fantastic. There are some farmers markets we were advised to visit ASAP for all their bounty. I can't wait. I'm not much of a world traveller but I do live vicariously through your blog entries! FX's answer→ Atlanta seems like a really nice place, and you will get to eat some serious, real, slow-smoked barbecue! I love farmers' markets and wish everybody could live not far from one. Have fun in Atlanta! What an amazing fair! I bet it smells wonderful too. FX's answer→ Fran, yes the smell is quite complex as there are many horses (not on my pictures) for the parade, and they do produce their own smell too! I'm from the US and have only been to Europe once to a Swiss-American school - I believe close to Vevay a small ski resort village in the mountains - for a few weeks visit. I wish I remember the town name but you may know it by the school. There was a "restaurant" in the town that was only open on special occasions and required walking about half a mile down a road to a chalet in the woods, more like a home. It was not open while we were there but I often wondered about it. FX's answer→ Steve, it may have been in Leysin where there are such camps. I hope it brings you pleasant memories of my country! Francois I wondering if you have the recipe for Gateau a la creme? My husband used to eat this when he was a child and I have not been able to duplicate it as he remembers. If you could please send it to me. I would appreciate it since his birthday is coming up and I would love to give him a big surprise. Hope you and your loved ones are well. 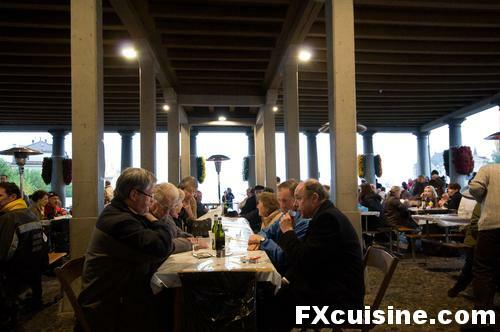 FX's answer→ Carmen thanks for your kind words, I'll try to make the visit-and-taste-with-me experience even better the next time, unfortunately I never can stay the whole day at this particular fair! 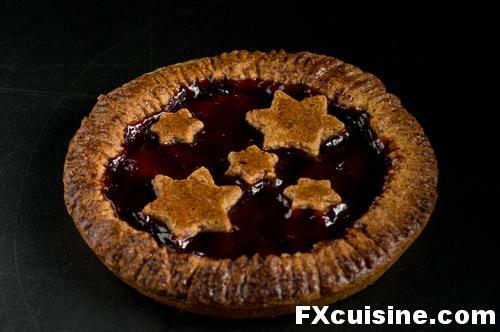 I have many recipes for tarte à la crême and will try to post an article so you can bake one for your husband. Is the moutarde the bénichon sweet or savory? Mustard seeds AND molasses? I've not come across it before, and I'm a fiend for mustard. Doesn't look like it would go on a hotdog though! FX's answer→ Shu, indeed this is a sort of confectionery/jam that uses spices including mustard seeds. Very surprising to modern taste buds, but if you cross the Alps and visit Northern Italy, each town has its own mostarda made with fruits, sugar, vinegar and mustard seeds. 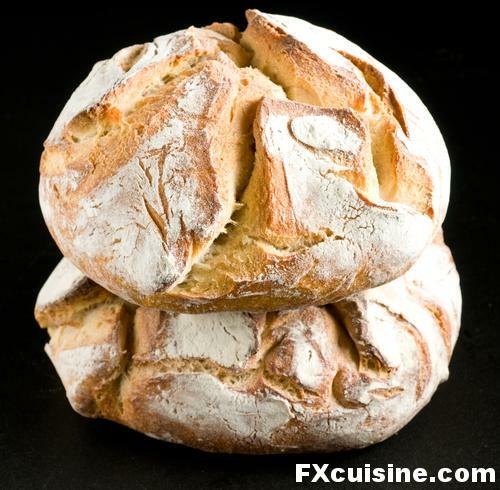 They use it mostly as a relish with meats and cheeses, whereas moutarde de bénichon is eaten with this special brioche known as "cuchaule". I bought some for a French friend whose kids love cuchaule but didn't hear back from her - surely the kids didn't like it much! I should put my apron on before I click on your posts. I was drooling throughout the entire article. I will attempt to make my own version of vin chaud for our Thanksgiving festivities. FX's answer→ Rose, I will try to post an altogether better recipe for vin chaud for December, so you'll get to make it twice this year I hope! A nice story and pictures. I think they eat Saint Martin goose in some other northern European countries, too. FX's answer→ Laura, this looks very Nils Olgersonesque! Is Skåne the most picturesque place to enjoy a Mårtensgås dinner? Does it already snow in this season? Thanks! Sure a rich fair about eating. You must have had a lot of fun there in finding a lot of your favorites. Everytime you wrote an article, you take me into another world with all those beautiful pictures and well-written story. Thank you so much, FX. I've been missing the Open Market since I moved to China. I used to visit every Sunday market when I studied in Holland and Germany, particularly the pre-Christmas market in Germany. It was so beautiful, the spirit, the ambience and unforgetable Gluhwein. Thank you for bringing all good time memories back! FX's answer→ Alvi I am sure you can find so many interesting things in China that we would never know here! If you have any interest in tea (gong gu cha) you could see sights every bit just as attractive by visiting Pu Erh or many other places in China, I'm sure! That looks like a very interesting place to be. I wish that there we more place such as these in the states - with very unique items to vend. When I saw the name of the town, I was intrigued because I have a dear friend who lived in Vevay, Indiana which has a large Swiss population; in fact it is the head city of Switzerland county with their La fête des vignerons. Keep up the good work with the site! I really enjoy the pieces about cheesemaking! FX's answer→ Peter, we also have many fairs in Europe that are not so nice, especially overcrowded "Christmas Markets" that sells crappy industrial items under the guise of artisan craft and overpriced processed sausages. 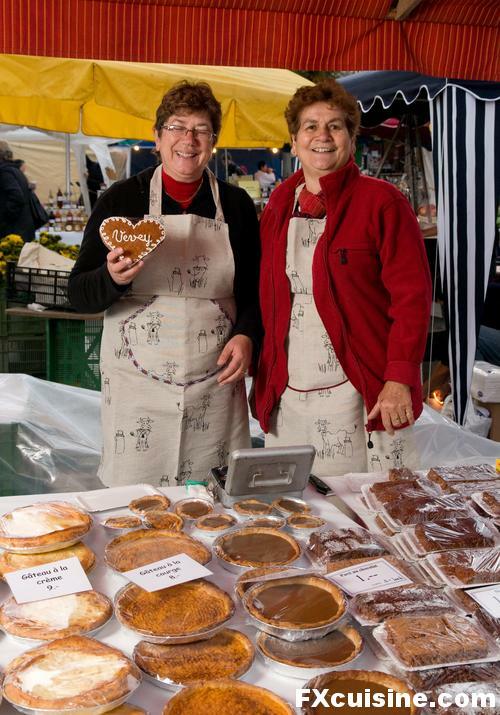 You really need to look a bit to find a proper fair/fete with really homemade, traditional products. FX's answer→ Glad to hear that although I wish we had more sun in this season! Great website!. It really is a trip down memory lane as I grew up in Switzerland. Do you have a recipe for the the cooked wine pie? Will have to visit Switzerland and all its markets soon! FX's answer→ Bronels, vin cuit is a reduction of pear and apple juices simmered for a day. If you are prepared to do this, all you need is then to garnish pie shells with that brown syrup. ha! I got there very early, before the rain, but had to rush for my train before I could take any photos. I bought some nonettes from those ladies in your picture, they were much enjoyed by my colleagues! Thanks for the market visit, so nice to see something familiar through someone else's eyes. 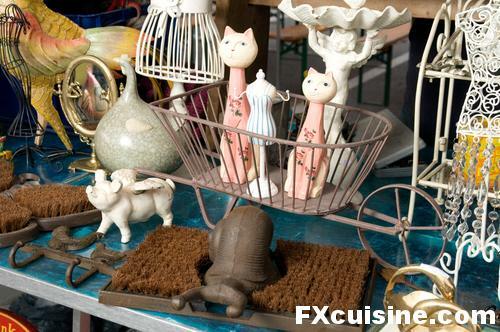 FX's answer→ Thanks Barbara, maybe you even saw me at the market that morning! 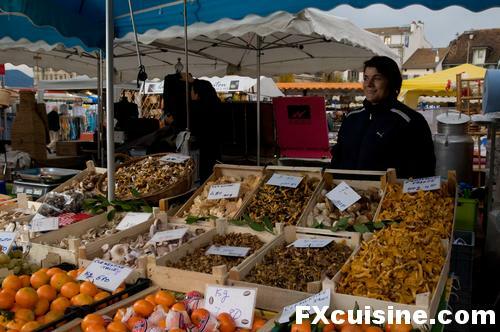 Francois, the open air markets are something I miss so much from my days living in Europe. 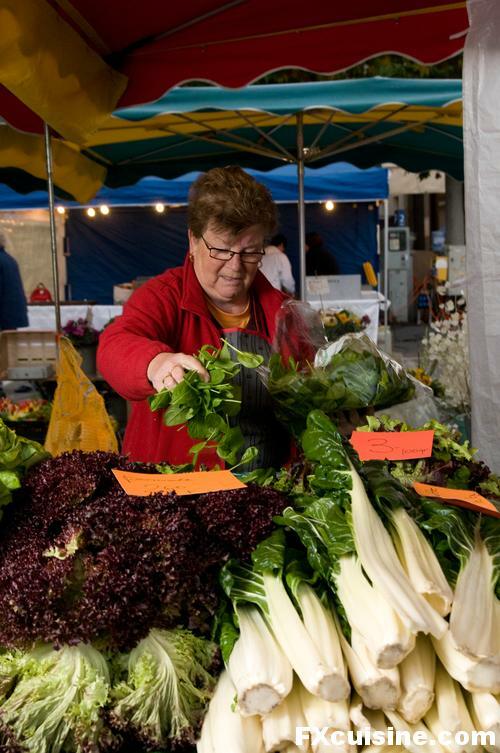 Country to country, the markets are full of local flavor you just can't get any other way. All the senses are involved which makes the memories gathered even stronger. Merci beaucoup, for bringing it back to me. 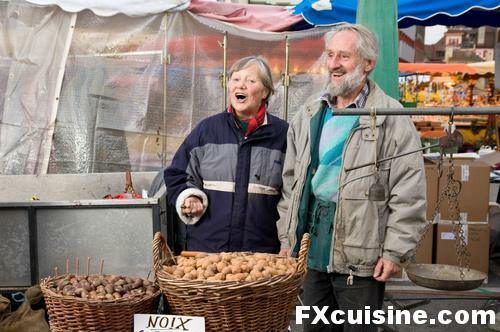 FX's answer→ Nan, don't you have Farmers Markets in the USA? Yes these are fine but we don't really have anything that people couldn't make or bake on the other side of the pond. 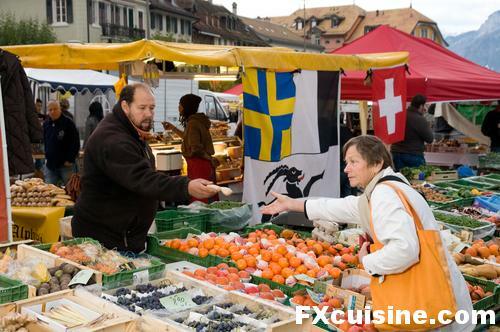 Hope you can visit one of our Swiss markets some day though! Now for an irrelevant observation. I was looking for infos on the French Foire S. Martin's traditional gypsy caravans, when I found your page.VG thanks. It was a magic moment when I glimpsed those richly carved and colorfully painted masterpieces while I was driving into Perpignan, to work. They were parked on the banks of the river and had apparently arrived overnight. Ah les trois couronnes, et dire que j'ai habite9 un an dans l'aile du be2timent sans meame aller sur la tearsrse. Mais j'ai tout de meame pu l'appre9cier une ou deux fois par la suite.Je trouve ce lieu tre8s agre9able, et hors du temps.